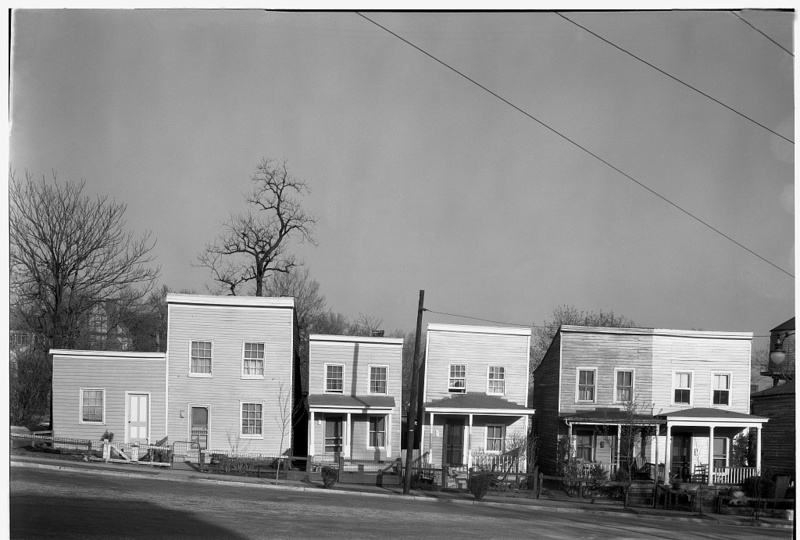 Deane’s Hill – Historic Fredericksburg Foundation, Inc.
Walker Evans, photographer. Farm Security Administration. Library of Congress. March 1935. In March 1935, Walker Evans—a photographer for the Resettlement Administration and later famous for his Farm Security Administration photos of the Depression—passed through Fredericksburg. He took two images of a set of four houses on what is now the 600 block of George Street. The houses Evans photographed were built by Henry Deane, an African American resident of Fredericksburg. Deane was a remarkable man with an apparently limitless capacity for work and a vision of the potential for the Liberty Town neighborhood. We know far too little of Henry Deane, and what we do know comes largely from newspaper accounts. He was born in slavery in July 1837 in Powhatan County. According to his obituary, Deane became the body servant of Gen. Nathan Bedford Forrest during the Civil War, before coming to Fredericksburg in 1868. In 1879, he married Lucy Combs, daughter of the former Town Cemetery sexton. Lucy became his partner in all his business accomplishments. Lucy and Henry had 11 children, including 2 they adopted. He was the only African American ever nominated by a City Council member to be a policeman in Fredericksburg. By his death in 1908, he was the most successful African American entrepreneur in Fredericksburg. Beginning in the late 1880s, Henry and Lucy paid local carpenters to build residences on land they had acquired at the western edge of Fredericksburg. The area of the Deanes’ enterprise was called “Liberty Town,” a name bestowed by the early 19th century developer Seth Barton, who platted this portion of the 18th century Kenmore estate of Fielding and Betty Lewis. The land was hardly ideal—it sloped down to a marshy meadow and an open ditch now covered by Kenmore Avenue. The area was the eastern terminus of the Swift Run Gap Turnpike, a corduroy toll road built to link commerce from beyond the Blue Ridge Mountains to the Port of Fredericksburg. The area was extensively developed in the 1820s, but Civil War actions destroyed the buildings, and the area defied further development through the 1870s and 1880s. Henry Deane was not a craftsman in the building trades, and his financial resources were virtually non-existent when he came to Fredericksburg in 1868. But he was vigorous and ambitious, and by working two jobs, saving, and cultivating relationships with his white employers, he was able to buy parcels of land that were unattractive to white developers. By subdividing the property into narrow odd-shaped lots and paying unnamed carpenters, this porter and livery stable operator and his wife would have 19 houses and 2 stables built on properties they owned. No other African American owning property during this time would build close to that number. Earlier, in 1888, Henry had built for his own family the largest house in the neighborhood. Deane’s house—no longer standing—was located on what is now 536 George Street. The area was known as Deane’s Hill. The other houses he built were on George, Hanover, and Barton streets. The stables and one of the houses were on Liberty Street. Now, only seven of the original houses remain, and few are owned by African American families. The remaining Deane buildings deserve to be recognized and recorded, giving testimony to the evolving social and cultural landscape of building innovation by and for people who had less access to wealth and power. The full article about Henry Dean entitled, “The Domestic Architecture of African-Americans during the Era of Jim Crow”, by Matt Scott and Gary Stanton is included in the Journal of Fredericksburg History, Volume 15. Available in digital format. Vlach, John Michael. “The Shotgun House: An African Architectural Legacy.” Common Places: Readings in American Vernacular Architecture. Dell Upton and John Michael Vlach, eds. Athens, GA: University Press of Georgia, 1986. Pp. 58-78. The Free Lance. “Henry Deane Dead: He was a Well Known Colored Citizen.” Fredericksburg, Va: The Free Lance Publishing Company, June 30, 1908. Page 3, column 2. “Certificate to obtain a marriage license, Henry Deane and Lucy A. Combs, issued 2 January 1879” S. F. Forbes, Deputy Clerk. Fredericksburg Corporation Court Clerk’s Office Annex.